INTRODUCTION: Bovine respiratory syncytial virus (bRSV) is a major cause of respiratory disease in young calves, and is responsible for significant economic losses throughout the world. More than 70% of calves exhibit a positive serological response against bRSV by the age of 12 months. Passively derived immunity does not appear to prevent bRSV infections but reduces the severity of disease. The virus replicates predominantly in ciliated respiratory epithelial cells and type II pneumocytes, and induces a wide range of proinflammatory cytokines and chemokines, which recruit neutrophils and lymphocytes to the lung, resulting in bronchiolitis and interstitial pneumonia. Inactivated and modified live attenuated vaccines are commercially available but they are poorly effective, especially in young calves with maternally derived serum antibodies. bRSV is genetically and antigenically closely related to human (h)RSV, which is the single most important cause of lower respiratory tract disease in young infants. As a natural pathogen of calves, bRSV infection recapitulates the pathogenesis of respiratory disease in man more faithfully than semi-permissive, animal models of hRSV infection. bRSV and hRSV are enveloped, non-segmented, negative-stranded RNA viruses belonging to the genus Pneumovirus, within the family Paramyxoviridae. Of the 11 proteins encoded by the viral genome, three transmembrane glycoproteins, the large attachment glycoprotein (G), the fusion protein (F) and the small hydrophobic protein (SH), are located in the viral envelope. The matrix protein (M) is present on the inner face of the envelope, and the nucleoprotein (N), phosphoprotein (P), RNA polymerase (L) and M2-1 constitute the nucleocapsid. 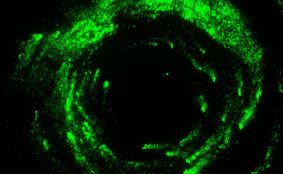 The M2-2 protein is expressed at low levels in infected cells; however, it is not clear if it is incorporated into virions. 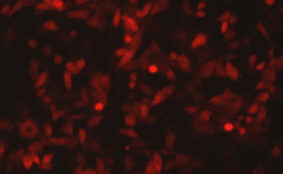 The two non-structural proteins, NS1 and NS2, are present in high levels in infected cells. 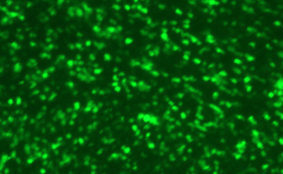 DESCRIPTION: For the construction of recombinant bRSV expressing green fluorescent protein (GFP), a cloning cassette containing the open reading frame (ORF) of GFP (EGFP, Clontech) flanked by bRSV transcriptional signals was generated via PCR. 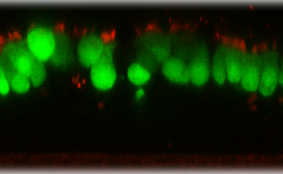 The GFP cassette was inserted between NS2 and N genes into the bRSV antigenome (bRSV strain ATue51908) as the third gene. 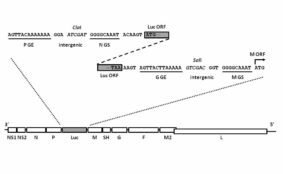 The correct sequences of the GFP ORF and the cloning site of the virus antigenome were confirmed by sequencing. 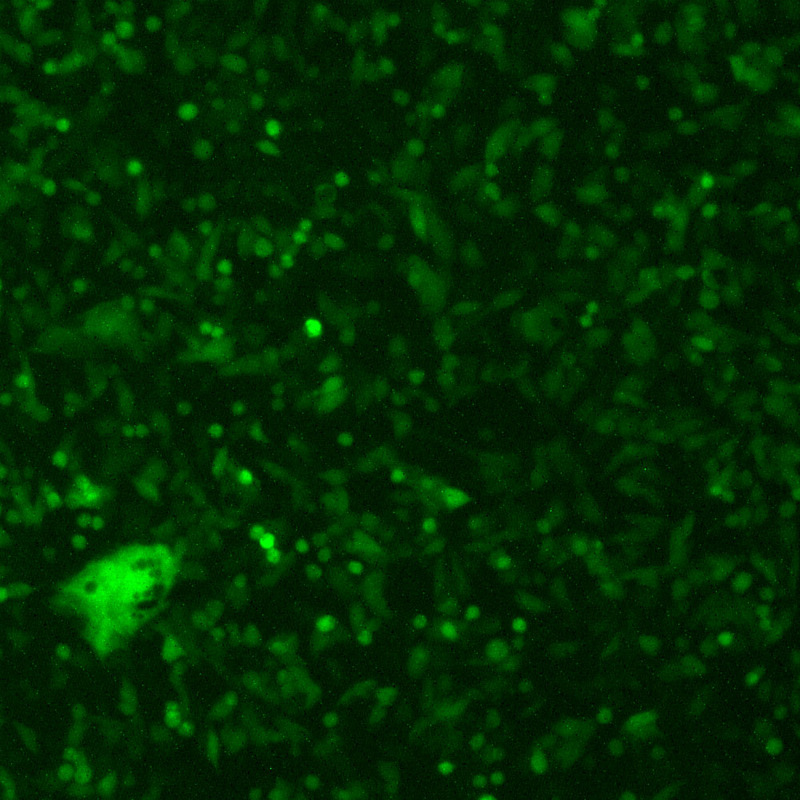 Recombinant bRSV-GFP1 virus was rescued by transfecting T7 polymerase-expressing BSR T7/5 cells with the full-length antigenome plasmid and plasmids expressing N, P, L, and M2-1 genes. 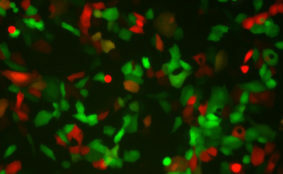 The rescued bRSV-GFP1 was further propagated in MDBK cells. bRSV-GFP1 was found to replicate as efficiently as its biological parental strain in cell cultures. Construction: GFP was inserted between NS2 and N genes as the 3rd gene. 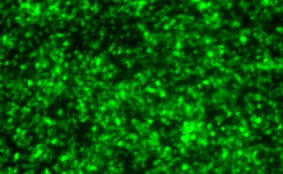 Passage History: The isolate was propagated in MDBK cells (ATCC CCL-22). Infectivity: Titer > 5.5 log 10 TCID50 per mL. Volume/Storage: 2 x 1.2 mL per cryovial. Store at –80ºC. Quality Testing: No bacteria, fungus, or mycoplasma detected. Endotoxin <10 EU/mL. Availability: Bulk quantity and custom orders are available. Contact info@viratree.com. ViraTree is a start-up company specializing in virology reagents and services. ViraTree currently provides unique viruses of the highest quality in a ready-to-use format to research laboratories in universities, medical facilities, and biotech companies around the world. To be notified of new products available from ViraTree, please subscribe to our product update newsletter. Copyright © 2019 ViraTree LLC. All rights reserved.